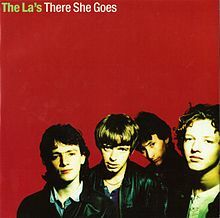 "There She Goes" is a song written by British singer/guitarist Lee Mavers and recorded first by Mavers' band, The La's. The La's, the self titled album by The La's, was the only studio release from the Liverpudlian four piece, released in 1990, but it earned them a place in the history books of British music and inspired a generation of bands, from Oasis to The Charlatans. It included "There She Goes", the group's biggest hit and one of the most memorable anthems of the early '90s, and "Timeless Melody". A deluxe edition of The La's was released on 7 April 2008. The La's are an English rock band from Liverpool, originally active from the mid-1980s to early 1990s. Fronted by singer, songwriter and guitarist Lee Mavers, the group is most famous for their hit single "There She Goes".